Age related macular degeneration (ARMD) is a retinal disease that, unfortunately, affects our macula which is where our critical vision is. The cause of ARMD is unknown. It is thought to be a build up of metabolic waste products from the retinal photoreceptors that are normally digested by the retinal pigmented epithelium, but, for some reason, don’t get metabolized properly. 1.75 million people in the U.S. have the advanced (or wet type) form of ARMD. This is the form that frequently destroys vision. 7 million have the mild or intermediate (or dry) form of ARMD. ARMD can progress from the mild to the intermediate to the advanced form, although most people never get the advanced form. Eighty percent of people with ARMD have the non-advanced (dry) form and good vision. However, 90% of the people with "severe vision loss" (defined as legal blindness or best corrected visual acuity of 20/200 with glasses on) due to ARMD have the advanced form of ARMD. Most of the other 10% with severe visual loss have a rare type of dry ARMD calledgeographic atrophy which is very difficult to treat. So, most people do not have the bad type of ARMD, but those that do develop advanced ARMD have a high chance of severe visual loss. Fortunately, new medicines have, for the first time, really decreased your chances of losing vision from advanced ARMD. More on that below. The major risk factors are increasing age, smoking, Caucasian race and a positive family history of ARMD. As you can see, the only risk factor that we can control is smoking. Other possible risk factors include low blood levels of anti-oxidant vitamins and minerals. The possibility that low blood levels of anti-oxidants were a risk factor for developing ARMD led to the AREDS study. This study showed that certain vitamins and minerals in high doses can reduce the incidence of progressing from the intermediate to the advanced ARMD by 25% after 5 years of taking the vitamins. (Some of these people took Centrum, some did not. Taking or not taking Centrum with or without the AREDS vitamins had no effect on the progression to advanced ARMD in the AREDS study.) This is a lot of benefit for just taking vitamins. Omega 3 polyunsaturated fats (fish oil) may also reduce your chances of getting ARMD, as well as help your heart and your dry eyes. Be aware that if you have smoked cigarettes in the past, taking the normal AREDS formula may increase your risk of developing lung cancer by almost 3 fold. Beta-carotene (or vitamin A) in the AREDS vitamins is the villain. If you have ever smoked, you cannot take the regular AREDS formula with vitamin A, but must instead take the formula without vitamin A. (Centrum does not contain enough vitamin A to increase your chances of getting lung cancer). Zinc by itself without the other vitamins in the AREDS study, reduced the chance of progressing to advanced ARMD by 21% over 5 years. So, just taking zinc alone in the AREDS study doses can significantly reduce your chances of progressing to advanced ARMD. But, zinc with the other AREDS vitamins, was even better at 25%! The AREDS study did not show a reduction in the risk of progressing from mild to intermediate ARMD for people over a five year period of taking the high dose AREDS vitamins and minerals. It is possible that over longer periods of follow up, there may be a benefit, but for now, taking the AREDS eye vitamins is not supported by the AREDS study for mild ARMD. Only your ophthalmologist can tell you if you have the mild or the intermediate form of ARMD. This is a bit more complicated than Paul Harvey makes it sound, isn’t it? *Some of the formulations that you buy may have slightly higher dosages due to a subsequent FDA ruling that says that labels must reflect amounts available at the end of shelf life, not the dose that was placed there when the vitamins were made. The side effects of the high dose AREDS vitamins and minerals include the increased risk of lung cancer (already reviewed), increased risk of hospitalization for urinary problems (mainly in men secondary to prostate hypertrophy made worse by the zinc), and a higher incidence of the skin having a yellow tinge to it. You can have your primary care physician review your history and see if taking zinc may be appropriate for you. Remember that zinc, by itself, offers significant protection against progressing from the intermediate form of ARMD to the advanced form of ARMD. A new study is underway, looking at whether different doses of anti-oxidants are helpful in treating ARMD. These vitamins are known as the AREDS 2 vitamins. They include Omega 3 fatty acids, also good for your heart, Lutein and Zeaxanthan but not vitamin A. The results are not in but with the evidence growing that anti-oxidants are proven to be of help in diseases, I have decided to take one half of the recommended dosages of AREDS 2 myself. The AREDS 2 vitamins avoid the Vitamin A resposible for the increase in death associated with smokers and includes Lutein, Zinc and Omega 3 fatty acids, all common anti-oxidants. You can decide for yourself what you wish to do. ARMD is suspected and for the most part diagnosed by your ophthalmologist when looking at your retina on a dilated eye exam.Drusen and pigment mottling are the classic appearance of ARMD as your Doctor looks at your retina. If your ophthalmologist suspects that you might have advanced (or the wet type of) ARMD, a dye test called anintravenous angiogram orIVFA will be done. The doctor will inject a dye into the veins in your arm and photograph it as it travels through your eye. Some people get a little nauseous on this test but it is a necessary test to do. Another way of detecting if you are progressing to the advanced form of ARMD is through the use of the Amsler grid. This is done by you at your home. You cover one eye, look at the center fixation dot on the grid given to you by your ophthalmologist and notice, out of the corner of your eye, if all of the lines are straight (normal), or if some of them look curved (a potential sign of developing the wet type of ARMD). Blink your eyes to make sure that debris in your tears are not distorting the grid. If some of the lines still look curved, see your ophthalmologist ASAP as this may be a sign that you might be progressing to the advanced form of ARMD. Seeing your ophthalmologist ASAP is very important as our anti-VEGF injections work better if we can start them as soon as the advanced form of ARMD begins. As discussed above, taking the AREDS eye vitamins in either the normal dose or in the smoker’s dose (which does not have vitamin A but should have zinc) can have a significant impact on your risk of developing advanced ARMD. Fortunately, if you develop the advanced form of ARMD, we have new medicines (called anti-VEGF, which stands for anti-vascular endothelial growth factor) that can arrest the neovascular growth that defines the wet type or bad type of advanced ARMD and frequently, save your vision. The FDA approved the first of these on December, 2004. These medicines are injected into the eyeball itself on a repeated basis. This may sound difficult, but many people have had this done to wonderful effect in recent years. There are some risks associated with this treatment, but I can tell you that any ophthalmologist that develops wet ARMD would want these injections done to their own eyes. 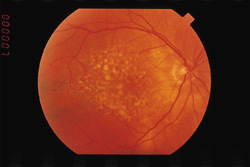 Anti-VEGF treatments do not help a rare kind of advanced ARMD that does not involve neovascular growth called geographic atrophy. Aside from eye vitamins, not much can be done for these patients. It is a very frustrating disease for both the patient and the doctor.